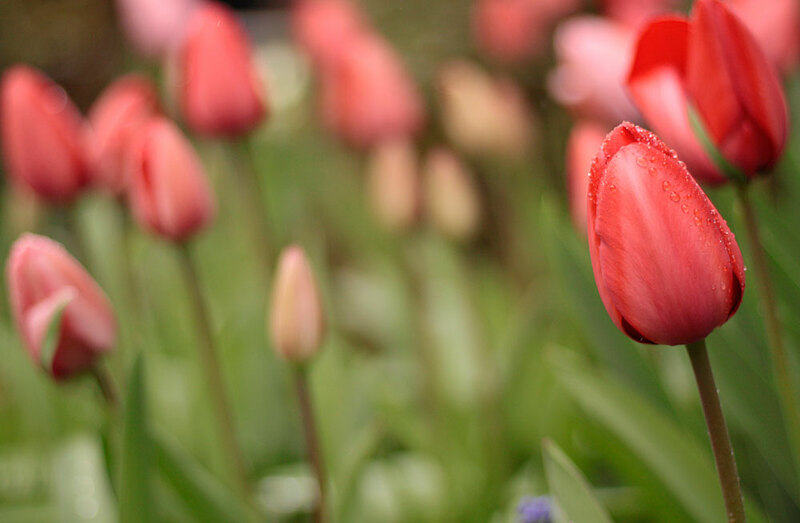 Bike Bruges and then see the beautiful spring flowers! 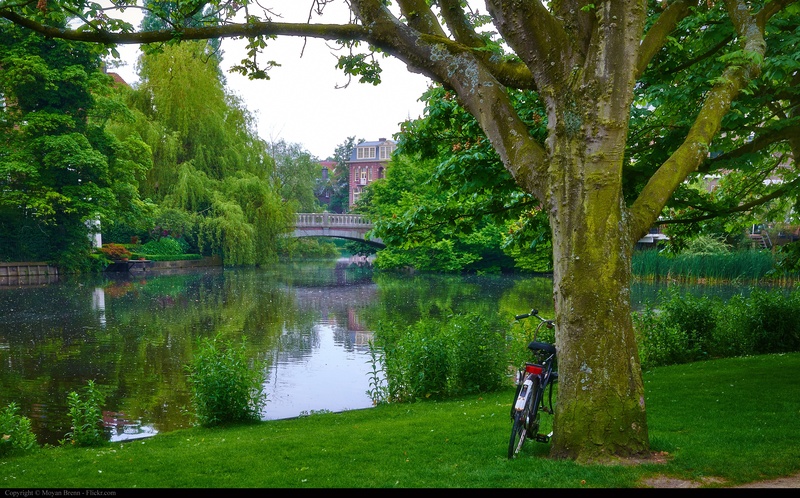 This cycling vacation takes you through the Belgian pearls of Antwerp, Ghent and on top of that, Bruges! 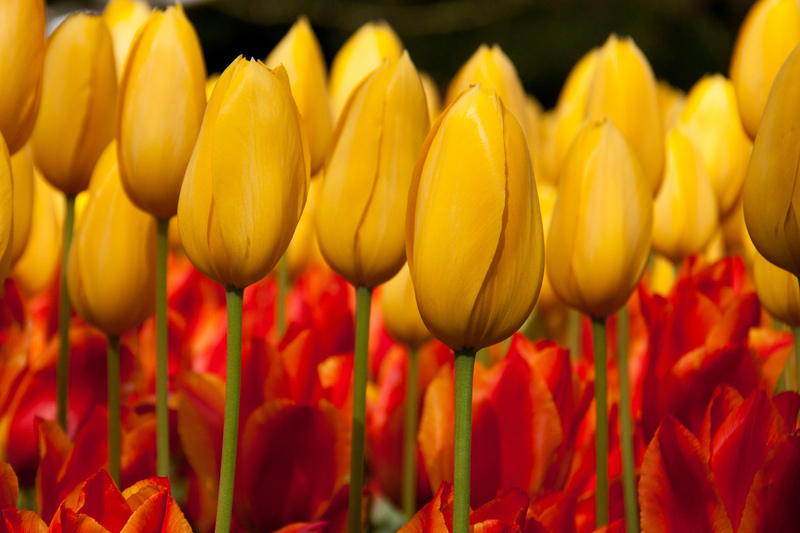 In April and May all of Holland is blooming. 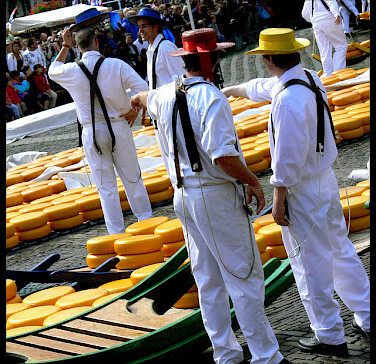 Furthermore, this tour shows you some lovely old Dutch towns like Dordrecht and Gouda, famous for their delicious cheese! 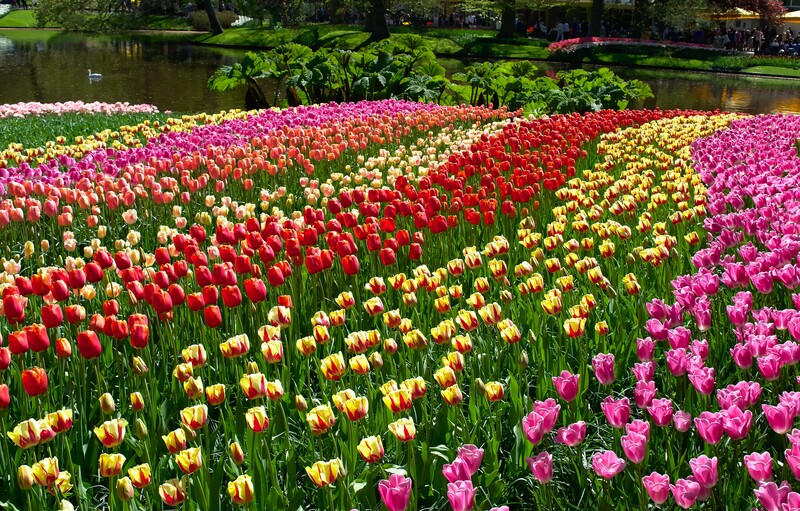 Highlight of this tulip themed bike and boat is a visit to the world famou Keukenhof! 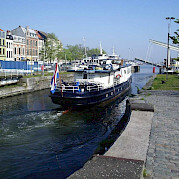 All of our other bike and barge tours in Belgium can be found here. Merlijn: £ 1319 $ 2,657 € 1525 NOK 14615 kr 13490 $ 1,754 Single supplement on request, limited availability. Fly to Amsterdam or Brussels International Airports. Train from Amsterdam airport to Bruges, approx. 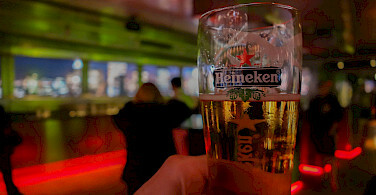 3¼ hr. at ± €40. Train from Brussels airport to Bruges, approx. 1.5 hr at ± €21. Check local weather conditions prior to departure. 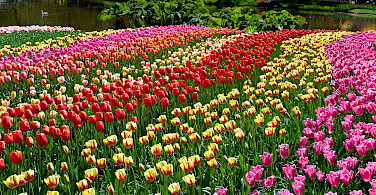 Average high/low temp in °F for Amsterdam: April 53/40º and May 61/46º. 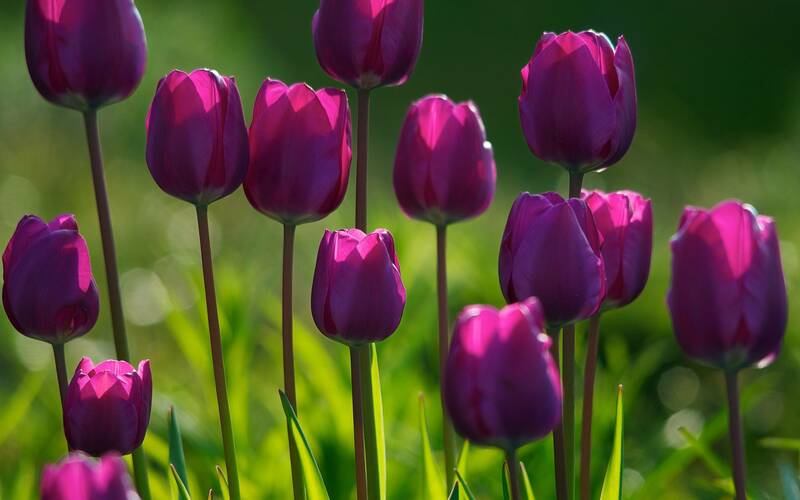 Please note: tulip season in Holland extends from the end of March to the middle of May but is dependent on temperatures and the weather. 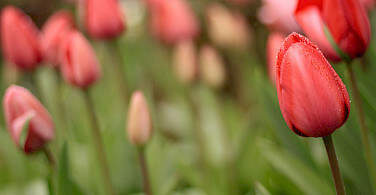 Going early or late in the season may affect what is in bloom. 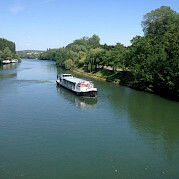 Easy, guided bike & boat tour. Bicycle routes follow mainly flat bike paths & country lanes with little traffic. Occasionally heavier traffic is encountered when entering the bigger cities. Daily cycling distances range from approximately 16 to 25 miles (25 to 40 km). Guide bikes with the group but it’s also possible to cycle on your own. Click barge information for further details about the classes of boats. 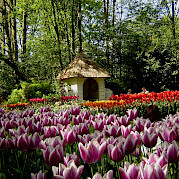 **Please note, if the Keukenhof is not open for the MAY 16, 2020 departure, a tour of the Cruquius will instead be offered. 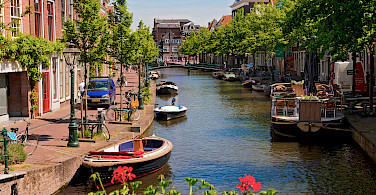 We can always assist you with arranging extra days in Amsterdam or Bruges. 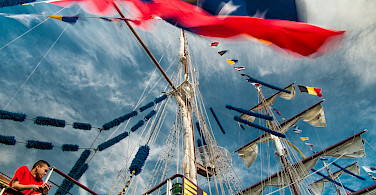 The Merlijn, your sailing hotel, awaits you in Bruges. Check-in begins at 1 PM. 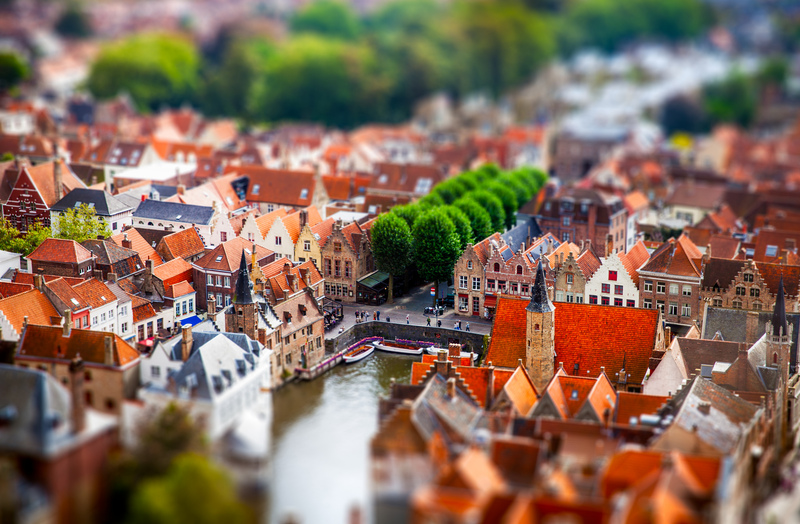 Bruges, also called the Venice of the North, is probably the most beautiful of all Flemish cities. Its old center, dating from the Middle Ages, is almost completely intact. 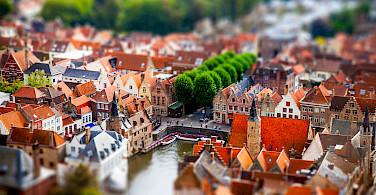 At that time, Bruges was a metropolis, the center of trade and art. 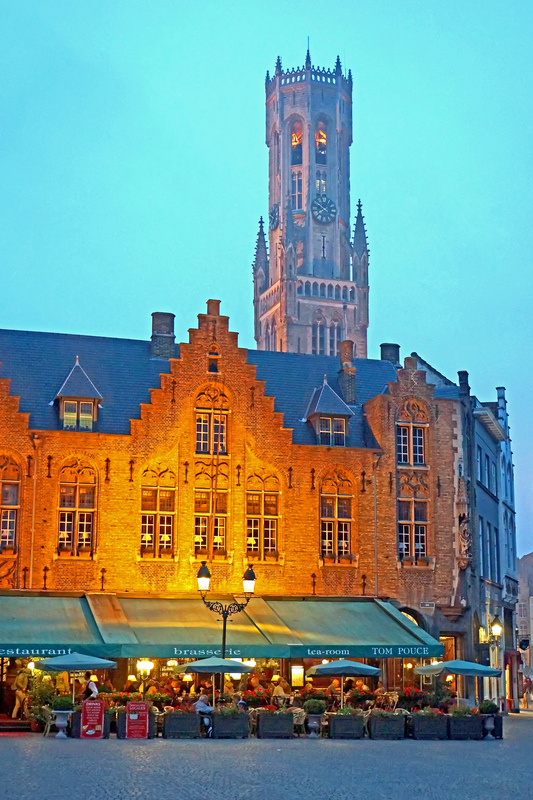 Please be sure your arrival time in Bruges gives you enough time to explore this charming city. The Merlijn will leave for Ghent at 2 PM. You are welcome to leave your luggage on board before 2 pm so that you can explore the city. 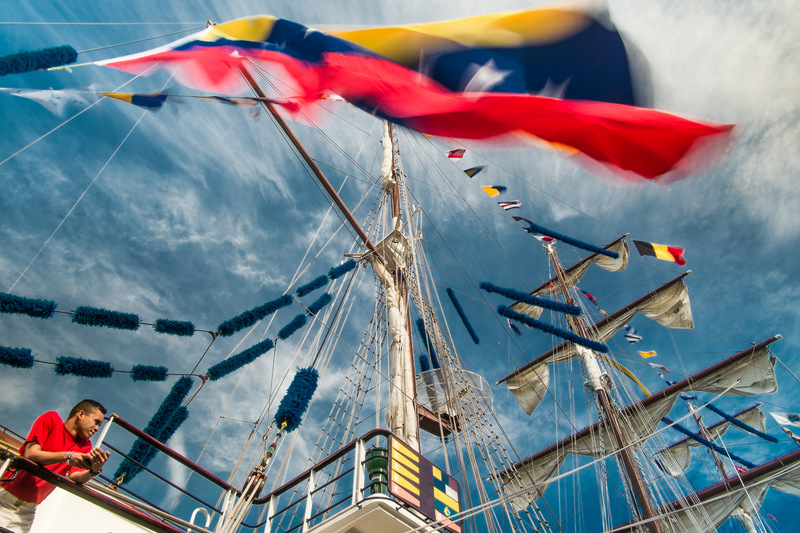 The crew will welcome you onboard and while you enjoy a welcome drink you will be informed about the barge and daily tours. 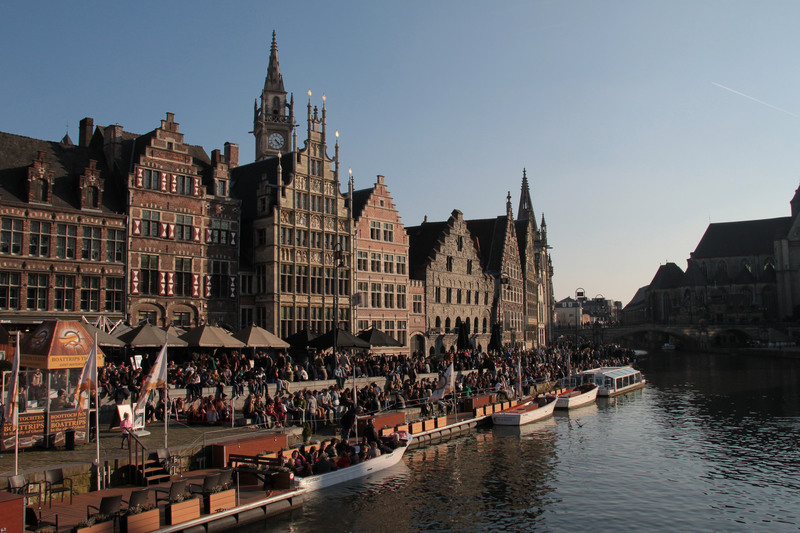 During the cruise to Ghent, you will enjoy your dinner. 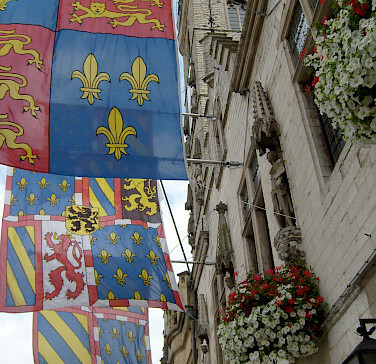 Following breakfast on board, you will have time to explore Ghent. This is a lively university city with a rich history. 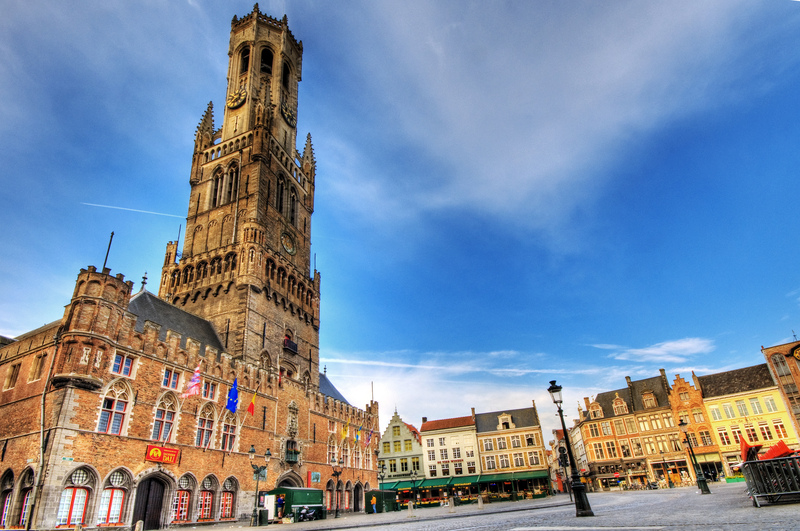 This city has a rich past originating in Roman Times and is located at the place where the rivers, Leie, and Schelde converge. This favorable situation brought a great deal of prosperity over the years, which had its peak late 13th, early 14th century. The textile industry brought great wealth. In the city center, many old patrician houses have been preserved. In the Clothmakers’ Hall (1425) textile merchants used to meet. The major church is St. Bavo's Cathedral, built in various ages and in various styles. 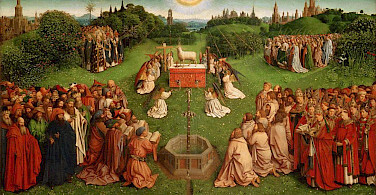 In the cathedral, you can admire a number of medieval paintings, including, ‘Adoration of the Lamb’ by Jan van Eyck. After your lunch break in Ghent your biking tour to Baasrode will begin. Cycle along the river Zeeschelde, and follow this beautiful but capricious tidal river downstream to our destination Baasrode, a small village on the Schelde river. Today's tour follows the river Schelde further downstream via Temse to Rupelmonde. There is a beautiful bike path along the river and the landscape around the Schelde is magnificent. 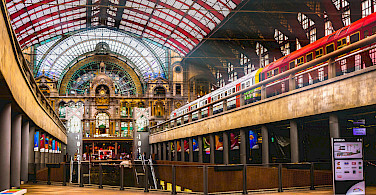 In Rupelmonde, board the Merlijn and cruise to Antwerp. 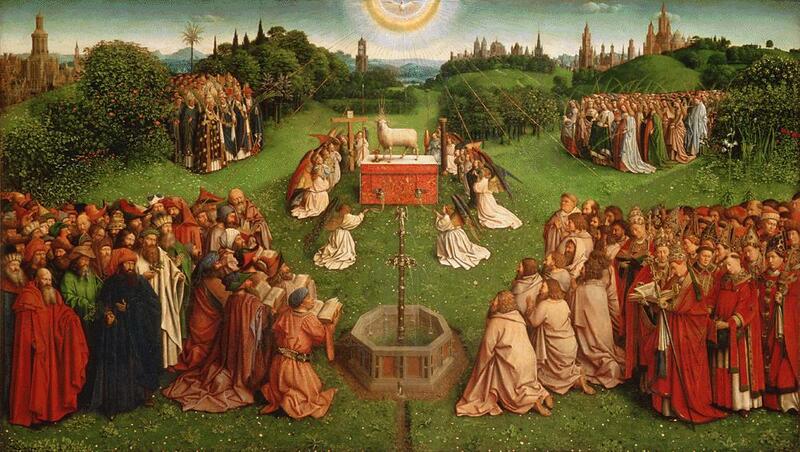 This is not only known as the diamond city but also as the native city of the painter Rubens. In the Rubens House, you can admire his work. 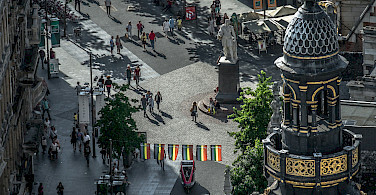 In the heart of the city, you will see the Cathedral of Our Lady and beautiful townhouses from a rich past are situated around the Market Square. 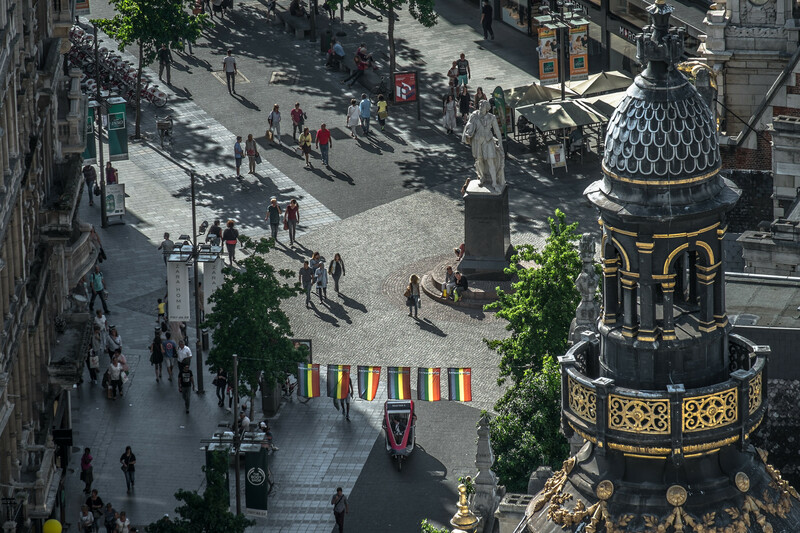 After breakfast, you will have more time to explore the city of Antwerp. 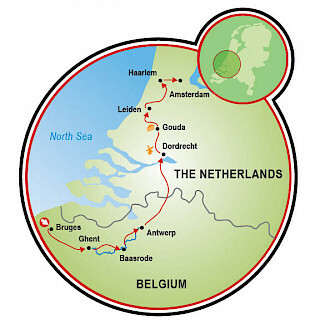 Your bike begins in Tholen, across the Oesterdam in the river Oosterschelde. This dam connects Tholen with Zeeland Flanders. Tholen was once an island in the middle of the large Zeeland streams, where many people were fishermen by trade. 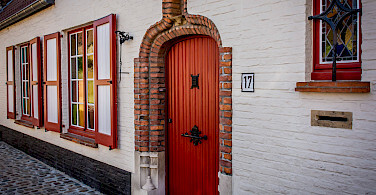 Today, Tholen is connected to the mainland in various ways, but it is still a picturesque village with many relics of an eventful past. 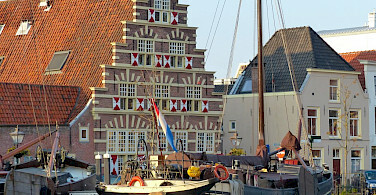 From Willemstad, the Merlijn cruises to Dordrecht, one of the oldest towns of Holland. 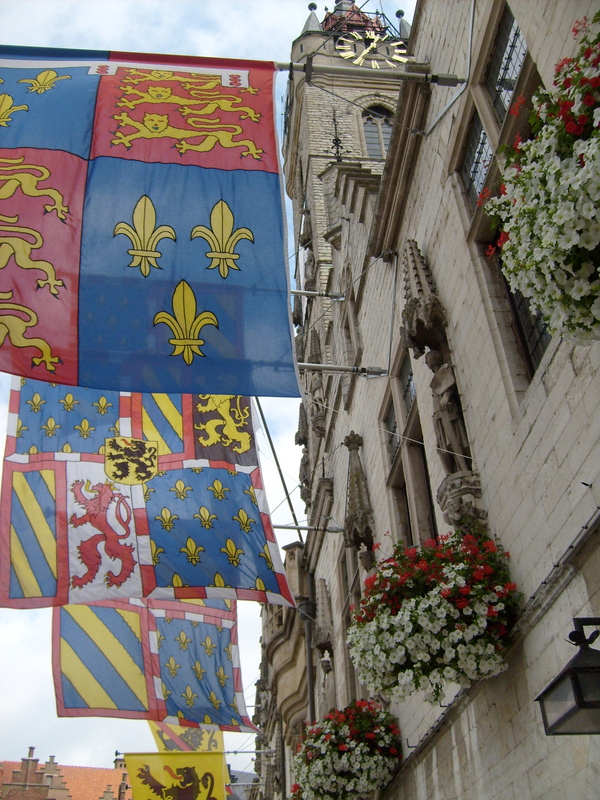 After dinner, you may want to stroll through this historic city. Tonight you will enjoy your dinner on your own in one of the many local restaurants. 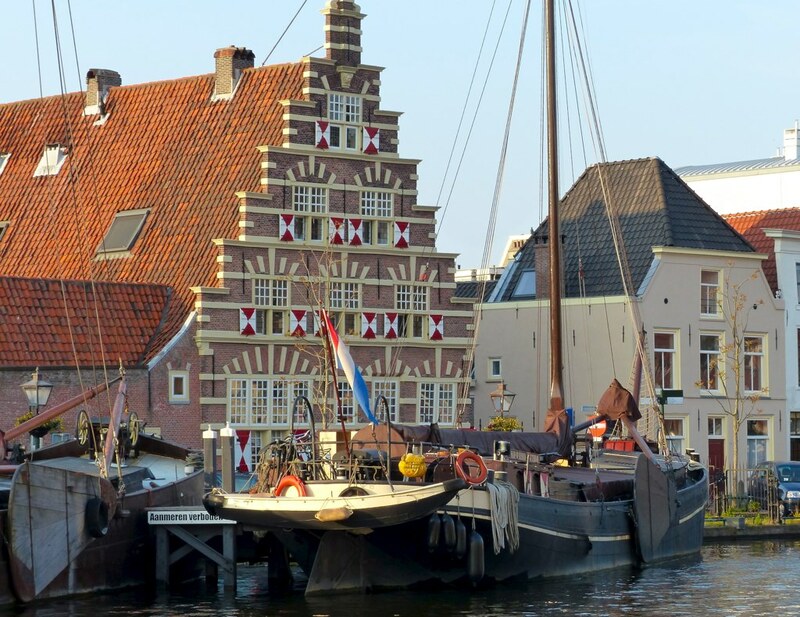 Enjoy a walking tour through the charming old city of Dordrecht and later the barge cruises to the Kinderdijk. 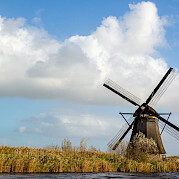 world famous for its impressive row of large windmills. They were built to drain the Alblasserwaard. You have the opportunity to take a tour inside one of the mills. 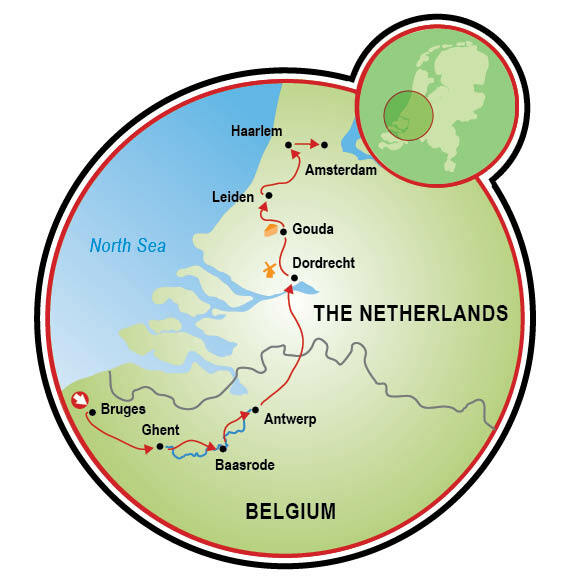 From here, your cycling tour begins en route to Gouda, the city of cheeses and candles. 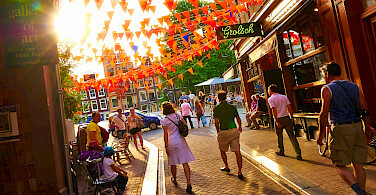 Before cruising to Leiden you can stroll through the center of Gouda. The barge takes you through one of the most beautiful parts of Holland, know as "the Green Heart of Holland". 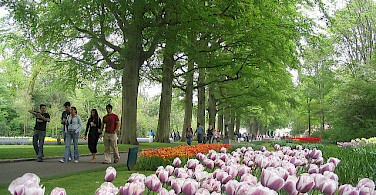 Leaving Gouda you pass Boskoop, famous for its horticulture, particularly woody plant, and perennial nurseries. 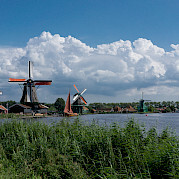 Along the way, you pass small cities and villages such as Alphen aan den Rijn. Finally, you reach Leiden. While exploring this city you will notice that its rich history still seems very much alive. This is where Rembrandt was born and developed his painting skills. 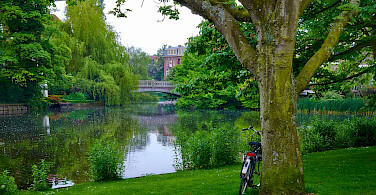 Holland's first university is located here, dating back to 1575. It has since developed into a world-famous center of science and its many students contribute to the lively atmosphere of the city. 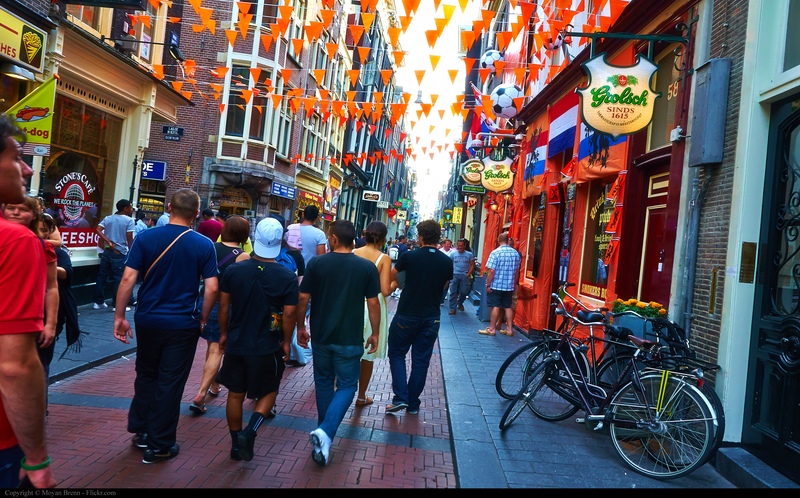 After dinner, there is time to explore the charming center. 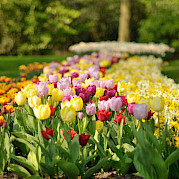 While you enjoy your breakfast, the Merlijn takes you to Lisse, which is near the Keukenhof, a famous flower exhibition. 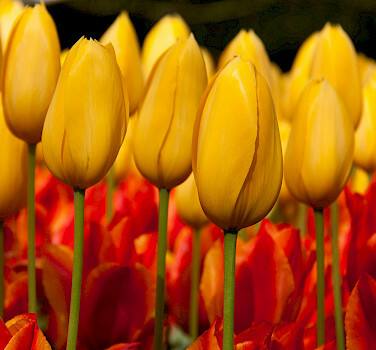 Here you can admire all the beautiful tulips and other flowers that are cultivated in Holland. 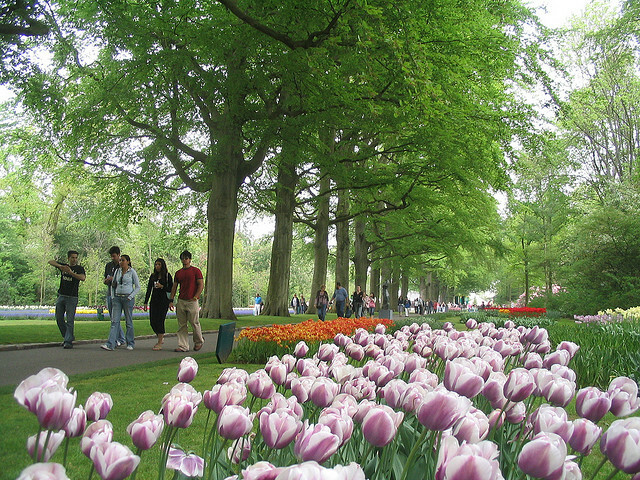 After your visit, cycle to the city of Haarlem, passing flower fields and great Dutch scenery. 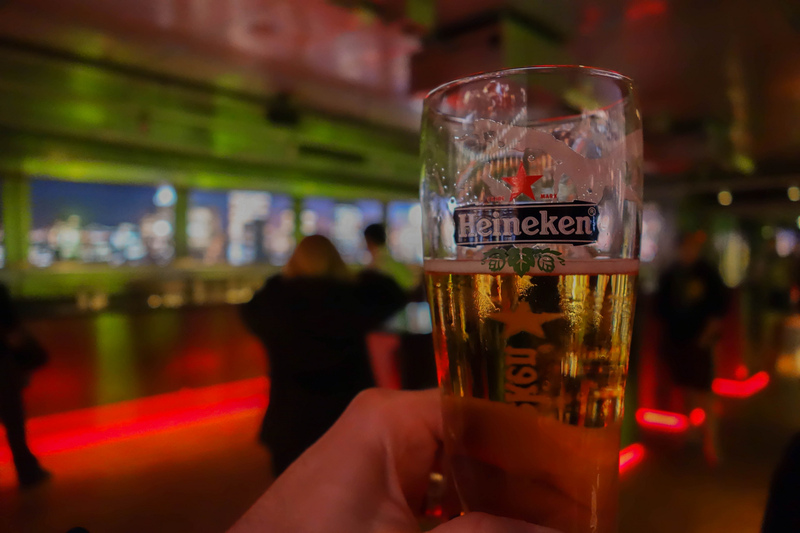 After dinner, take a stroll through the historical city of Haarlem and end your trip drinking the famous local “Jopen” beer in one of the many bars. 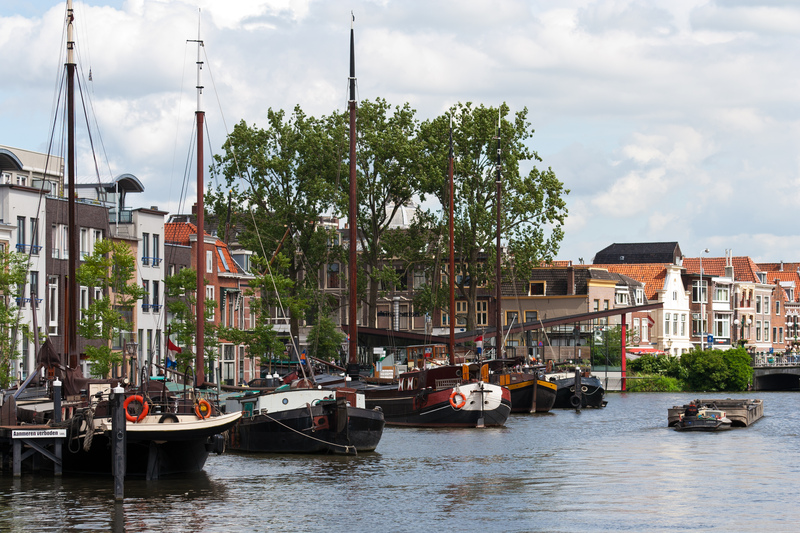 In the morning, explore the historical city of Haarlem a little more before your cycling tour starts. Its history goes back to the 10th century. Your tour ends in Amsterdam, the capital of the Netherlands. 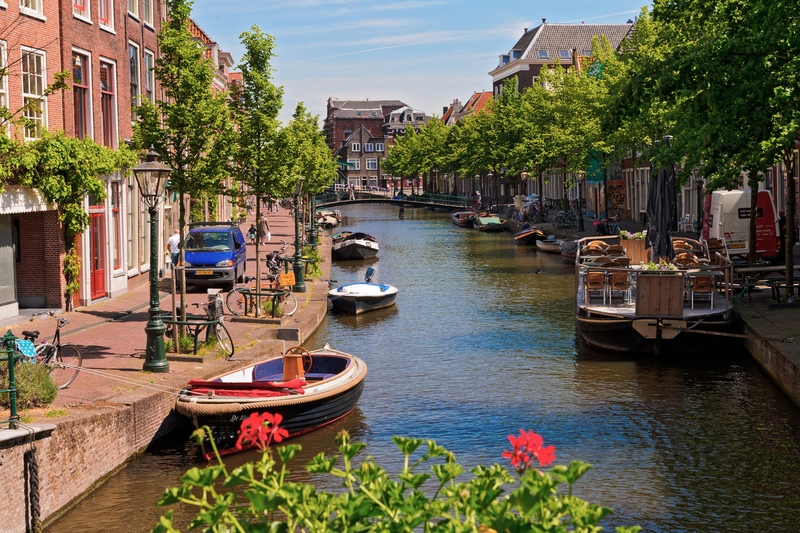 There is time to explore the city and you might want to include a ride through the canals. 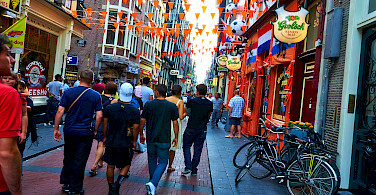 Later on, you may want to visit the Rijksmuseum or the Van Gogh museum. 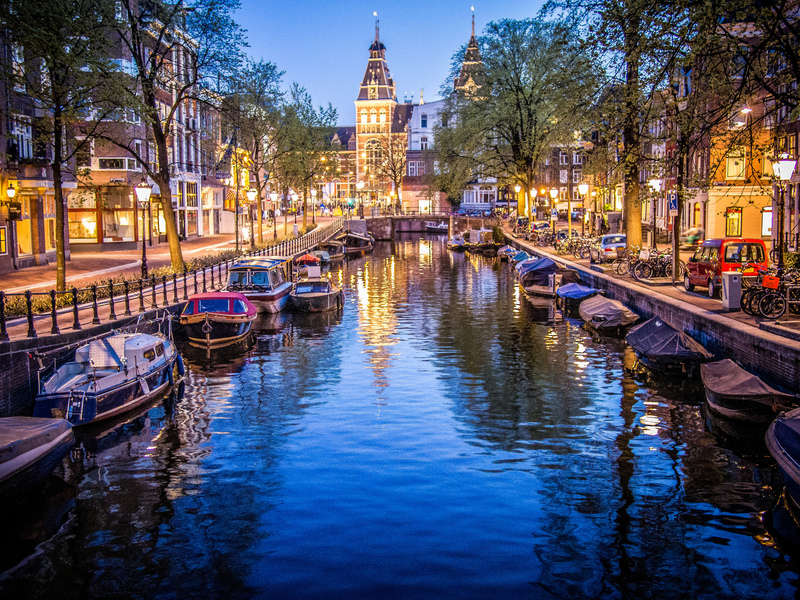 Enjoy a farewell dinner on board and city walk through the beautiful illuminated lively center of Amsterdam. ​Breakfast, check out, and departure. After your arrival to the Amsterdam airport, a bus will be waiting to transport you to Ghent where you will meet the barge and begin your cycling vacation. 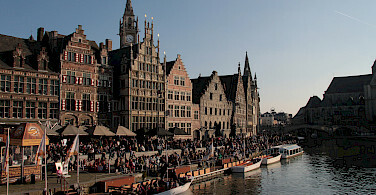 In the evening, a short guided walk or bicycle tour in the beautiful center of Ghent is on the agenda. 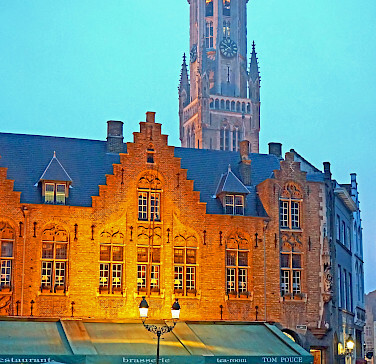 In the morning, you will travel by train to Bruges. 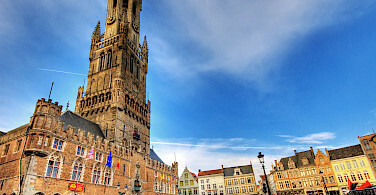 Upon your arrival, a horse carriage ride and a short guided walk past the many historic monuments in the center of Bruges is planned. The rest of the afternoon is yours to further explore the city and visit the many highlights. 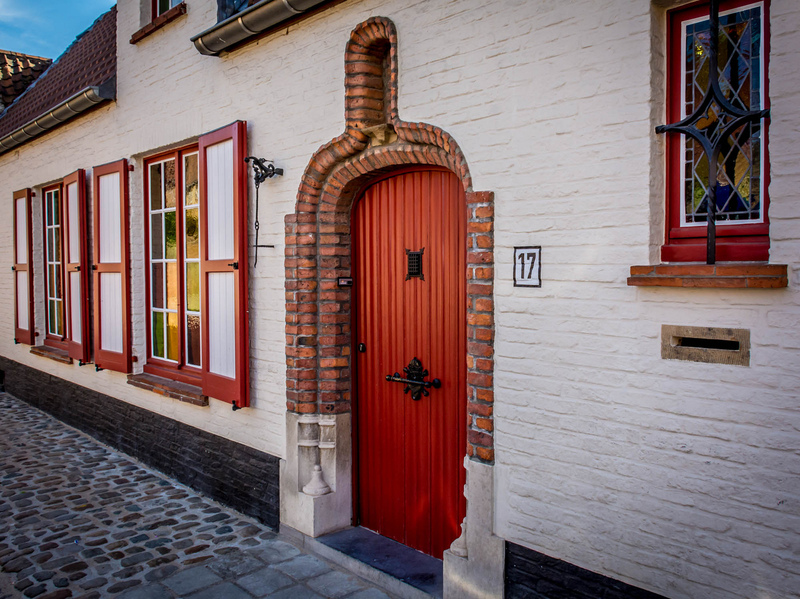 You return by train to Dendermonde and in the evening, your tour guide will take you for a walk across the town center. This morning, the barge departs for Antwerp. Cyclists will hit the road and enjoy the flat Flemish countryside. 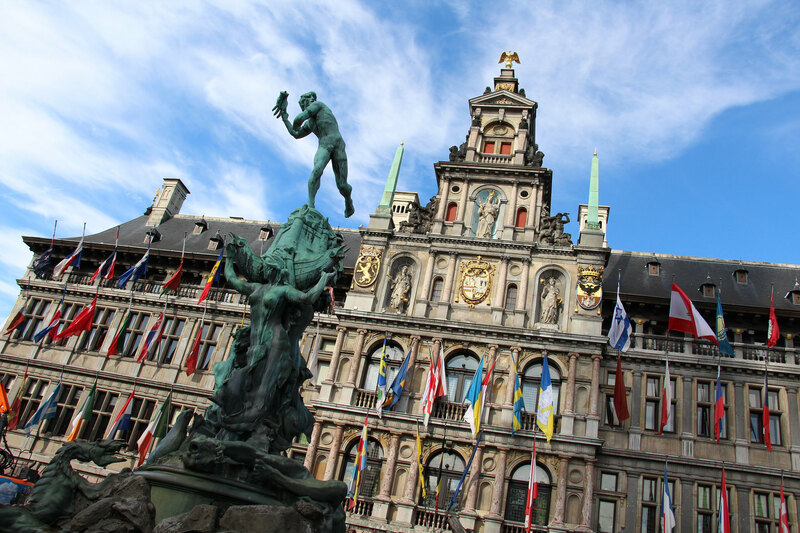 In Antwerp, the tour guide will invite you on a short walk through the town. 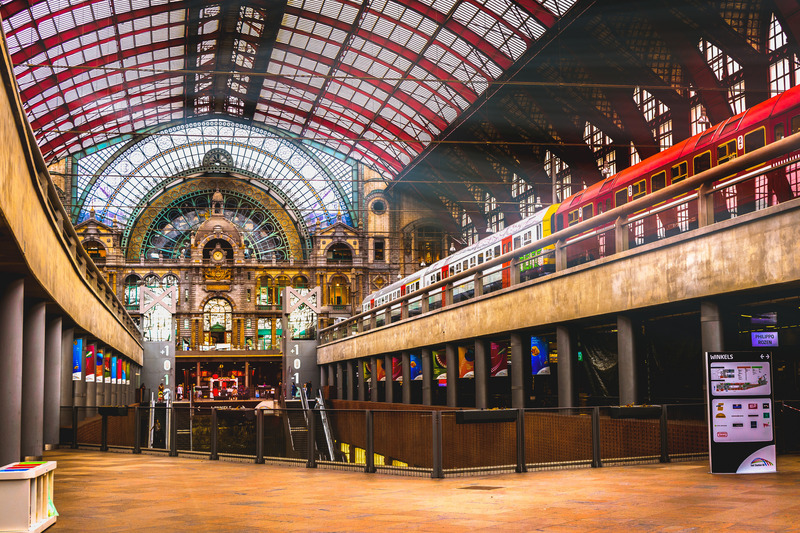 For the rest of the afternoon and the evening, you are free to explore Antwerp's lively town center. 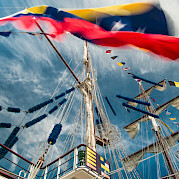 During the first stretch of today's route you will sail aboard your hotel ship. 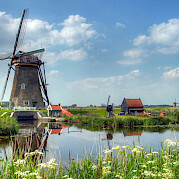 On bike you visit the beautiful old Dutch town of Dordrecht and the world famous windmills of Kinderdijk. 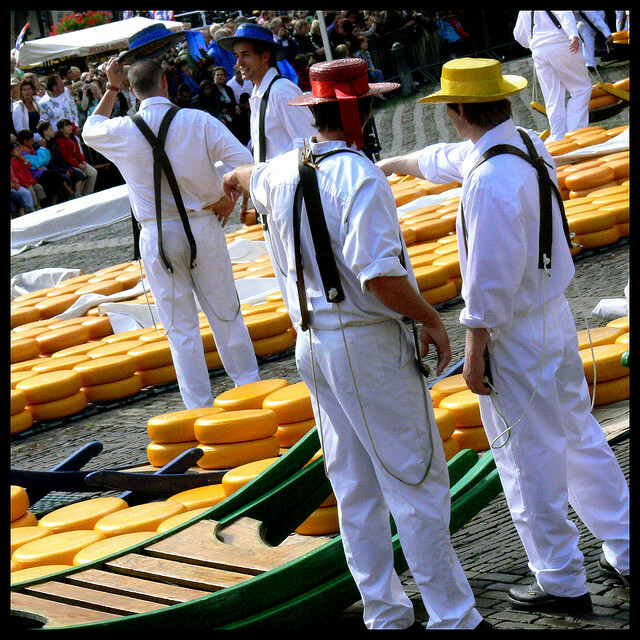 The overnight stay is in the cheese town of Gouda, where you may wish to join your tour leader for a short city walk in the evening. 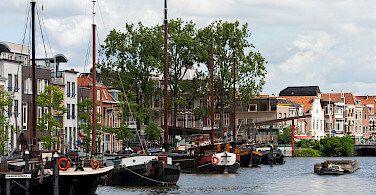 This morning, you cycle to Amsterdam following the Amstel river all the way to the port. 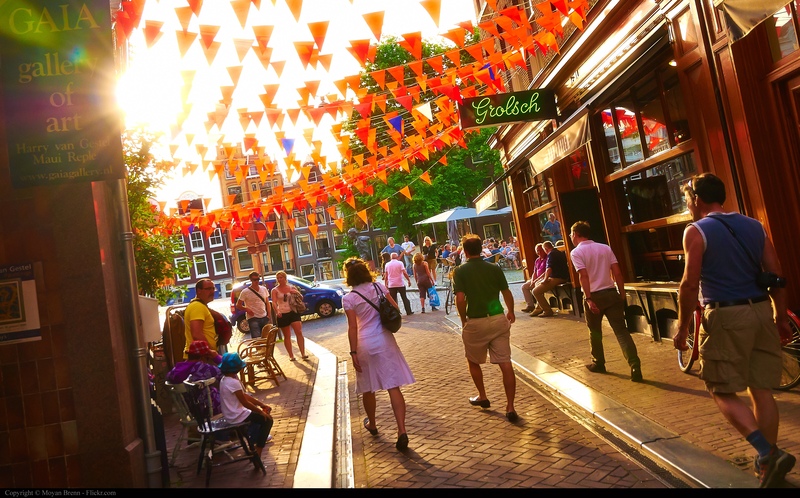 After arrival, you will have free time to explore Amsterdam. 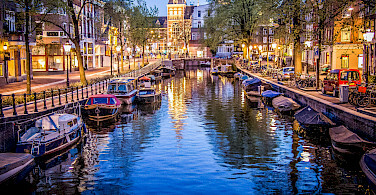 In the evening, there is a guided city walk and you may wish to take a boat ride on the famous Amsterdam canals. Check out and departure after breakfast. Important note for passengers aboard the Clair de Lune and the Tijdgeest: Due to restrictions by Belgian naval authorities, passengers are no longer allowed to remain on board while the barge motors the Belgian waterways. Noncycling participants will be required to take a taxi or public transportation at their own expense. The tour leader will provide details on board. This tour is run by HAT tours, Jantien Wondergem. 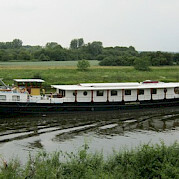 The Merlijn was definitely a "comfort plus" barge. Rooms and beds very comfortable; staff couldn't have been friendlier or more accommodating; Captain Henk was a genius at docking and piloting the barge; our guide Lea, was professional, knowledgeable, and fun; Jantien, the jack of all trades, did everything from ministering to ill or injured to cooking gourmet meals. This was my second trip on the Merlijn. We booked the entire barge. There were two fantastic upgrades from two years ago--new bikes and helmets and better internet. Obviously, I cannot say enough positive about this experience. Highly recommend it. 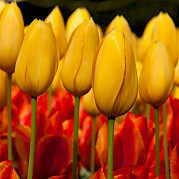 Have forwarded the link to your website to a number of our friends as we describe the fabulous experience on our tulip tour. 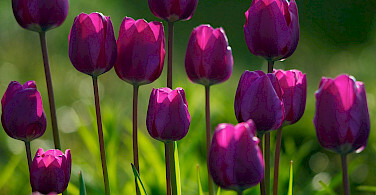 Most memorable was being our timing in seeing the tulips in full bloom in the fields. But, every day was memorable! We loved the getting to experience the Kinderdijk!!! The guide and crew were amazing. Great home cooked meals with personal atmosphere. Very good trip. All different levels of bike riders, but somehow it worked! I did not feel pressured to keep up. Our guide Ari was patient and stressed enjoyment of scenery etc. - yet we averaged 25 a 30 mi./day. Wonderful!